We don’t often recognize the humble activity of cooking for the revolutionary cultural adaptation that it is. But when the hearth fires started burning in the Paleolithic, humankind broadened the exploitation of food and took one of several great leaps forward. All life on earth is dependent on energy from the sun, but one species has evolved to be especially efficient in tapping that supply. This is the story of the human species and its dedicated effort to sustain and elevate itself by making the earth’s stores of energy its own. A story of slow evolutionary change and sharp revolutionary departures, it takes readers from the origins of the species to our current fork in the road. With a winning blend of wit and insight, Alfred W. Crosby reveals the fundamental ways in which humans have transformed the world and themselves in their quest for energy. When they first started, humans found fuel much like other species in the simple harvesting of wild plants and animals. A major turn in the human career came with the domestication of fire, an unprecedented achievement unique to the species. The greatest advantage from this breakthrough came in its application to food. Cooking vastly increased the store of organic matter our ancestors could tap as food, and the range of places they could live. As they spread over the earth, humans became more complicated harvesters, negotiating alliances with several other species—plant and animal—leading to the birth of agriculture and civilizations. For millennia these civilizations tapped sun energy through the burning of recently living biomass—wood, for instance. But humans again took a revolutionary turn in the last two centuries with the systematic burning of fossilized biomass. 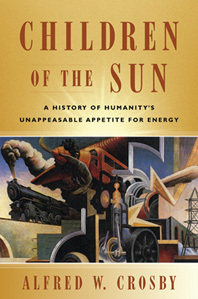 Fossil fuels have powered our industrial civilization and in turn multiplied our demand for sun energy. Here we are then, on the verge of exceeding what the available sources of sun energy can conventionally afford us, and suffering the ill effects of our seemingly insatiable energy appetite. A found of the field of global history, Crosby gives a book that glows with illuminating power.